Another beautiful day in Paradise. We had beautiful clear blue skies with nice cool temperatures in the 60s with a little NE breeze. 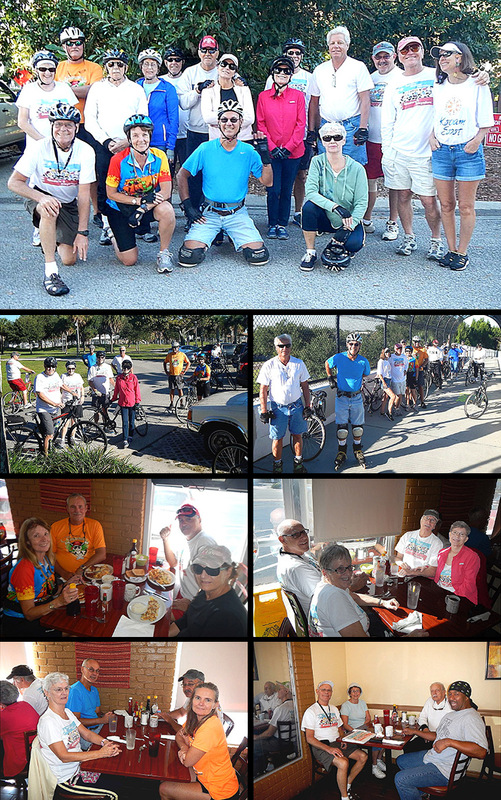 Bladers/bicyclers Wilma F, Bill H, Bob & Nancy F, Jim F, Rick P & Ginny S, Linda & Dan C, Jim H, Rob H, John L & Joanie C, Bruce M, Cathy H, Jeff B and Carol J. came and are in the group picture. Iara B and Kim F joined us on the trail. Welcome all. We did our usual route down the trail to Demens Landing Park and back. However we did search around the Demens Landing area for restrooms that weren't locked. The weather was very refreshing and made the blade/bicycle so much nicer. Almost all did the 14 mile round trip. We had 4 bladers and 16 bicyclers. Iara B became a Sponsor today. Thanks Iara for the website support. We Brunched at Kay's restaurant as planned. We got right in and seated at four tables. Service was good, the coffee flowed nicely and the food was very good. We had ratings from 9.5 to 9.8. We'll give Kay's a 9.65. Kay's was very busy and not the place to have a Website meeting as planned. Breeze was still researching servers and software so we decided we'd try for another Website meeting after Halloween.